Video Game Firsts - FM Towns Marty | Warped Factor - Words in the Key of Geek. We enter the fifth generation of video game consoles, not with the Sony Playstation, the Sega Saturn or the Nintendo 64, but with a little known console called the FM Towns Marty - I know, right? Catchy name! 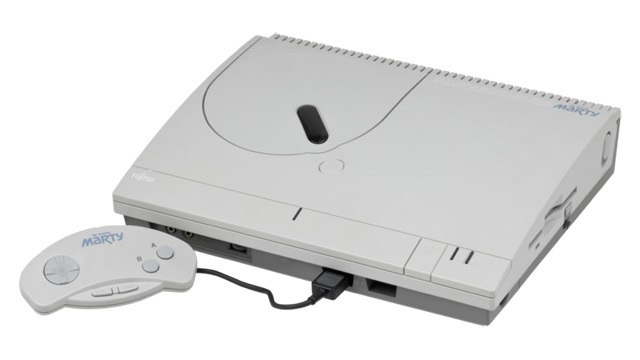 The FM Towns Marty was the first 32-bit home video game system, and came complete with a built in CD-ROM drive and disk drive. It was based on the earlier FM Towns computer system Fujitsu had released in 1989, and was backward-compatible with older FM Towns games. In 1994 a new version of the console called the FM Towns Marty 2 was released. It featured a darker gray shell and a lower RRP, but was otherwise identical to the first Marty. There was also the FM Towns Car Marty. As the name may allow you to infer, it was for installation in automobiles. It included a built in navigation system with audio and video guidance, and could also be detached from the car and played at home. 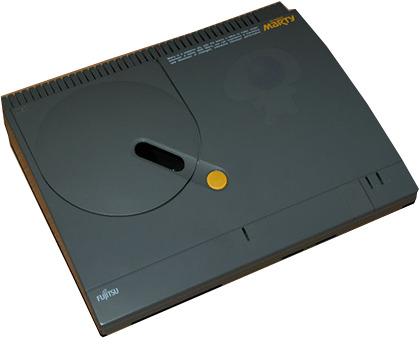 Despite having excellent hardware from a gaming perspective, both the FM Towns and the FM Towns Marty were very poor sellers in Japan, and despite backwards compatibility with most older FM Towns PC games, compatibility issues plagued the Marty as newer titles were released with the FM Towns in mind, further limiting its potential as a true "console version" of the Fujitsu FM Towns PC. 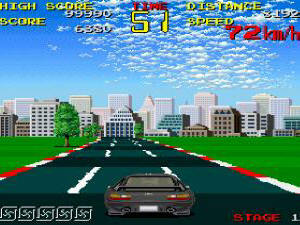 The Marty did have its own library of "Marty" specific games, but they were not enough to strengthen its niche position between video game console systems and personal computers. When Fujitsu lowered the price and released the Marty 2 sales started to increase, but the corporate attitude was that it was a lost cause, and so the system was dropped after just 45,000 units were sold. This led to the creation of the Japanese "Marty's Law": if you don't keep offering something to sell, you can't increase sales.